In the previous parts of this blog post series about the fundamentals of driving a Tesla, I already covered some important questions about supercharging and real-world driving range. In this post I’ll cover the increasingly more asked question why Teslas don’t have dashcams built into the cars from the factory. OK, so most of you will be familiar with dashcams, but maybe some of you are not. So, here is some short explanation what it is and what it can be used for: a dashcam is a separate camera systems that is mounted inside your car on your dashboard or on the windshield to record your surroundings. This can be used as evidence when you are involved in an accident or when you witness road rage. But it can also be used to capture the beautiful scenery you drive through on your road trip, so you can record it and share it with friends and family when you get back home. A third reason to install a dashcam in your car is to capture unexpected events. Remember all the dashcam footage of the once in a lifetime meteorite explosion over Russia a few years ago? Wouldn’t you be glad to have this on camera if it happened near you? A fourth reason is a personal one for me and very specific to Tesla. I use the dashcam footage to send it to Tesla whenever autopilot is acting up, doing something unusual, something I didn’t expect, or something just plain dangerous. And also to provide feedback when the car saves the day. The good people at tesla can only look at the world from the car’s log files when you report an AutoPilot fluke. They really do appreciate the fact that I’m sending them footage of the surroundings and the seconds before things went wrong, so they can better investigate and fix the bug. But like I said, this last one is a personal reason and even though I like to invest all that time into helping Tesla improve their AutoPilot and autonomous driving (basically for free), you might not be so interested in that and that’s perfectly fine. Why don’t Tesla include dashcams? Why can’t the AutoPilot camera be used as dashcam? Why doesn’t a Tesla car come with a dashcam included? Both questions are certainly valid and I’ll try to explain both from my personal point of view. So, any information here is not guaranteed to be representative of the real reason why Tesla isn’t doing this, but rather my personal take on it. This is a very good one to start with, since all Tesla vehicles produced after October 15, 2014 have AutoPilot capabilities. That means they have 1 forward facing camera and 1 Full HD backup camera. The newer cars with the so-called “hardware 2” even have 8 cameras surrounding the car: 3 front-facing, 2 rear-facing in the side repeaters, 2 side-facing in the B-pillar and one rear-facing above the license plate. So, why can’t any of these be used as dashcam? Well, for starters, while the cameras (at least in AP1 cars) are perfectly capable of recording high definition RGB video quality, they have a specific goal and need to be able to work with high contrast. The car needs super fast image processing to be able to eventually do full self drive. That is why the footage itself is not Red-Green-Blue, but rather Grey-Grey-Red, because that saves a ton of data to analyse. Practically, using their footage would be only result in black and white footage. Another reason is that the footage is never stored anywhere in the car. They are only used for real-time processing. Saving the footage of these cameras would require a huge amount of storage to be available and would slow down processing and therefore also reaction time and capabilities of the system. Now, I do have to add here in all honesty that Tesla themselves use the front camera to capture 8 stills from the last few seconds before a crash and saves those to the car’s system. Hacker @wk057, who also disassembled the P100D battery I talked about in a previous post, has been able to access those images. But with 8 black-and-white frames you wont really have enough evidence for a judge. And also, there is no easy way to get to those images yourself without hacking into your car, basically voiding all warranty on it in the process. Secondly, it needs to be economically viable. There is more to this than you might think at first. If Tesla were to make this an option, then they have to be able to adjust their production line to include this additional hardware. This step would include installing a different wiring harness, additional placement of the camera(s), and of course adjusting the trim. So, you see, this is not just one additional step, but several steps along the production line. This would probably make it a costly option. They could, however, put it in every single car and have it software unlocked when you pay for the option. But again, there are several additional steps to be taken in the process and Tesla also has to adhere to the local legislation. 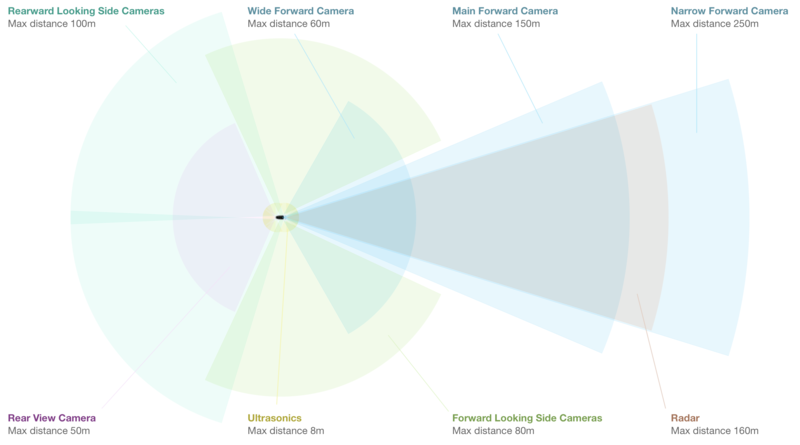 So, we’ve come to the grey zone of legislation around dashcams in the European countries. One of the reasons Tesla simply cannot implement dashcams as standard I their cars, is the fact that dashcams are not allowed in all countries. I don’t know how it is for the world outside of the EU, but different countries have different rules and sometimes it is hard to figure out what is possible or legal. And most of these rules or laws have to do with privacy legislation. Take Austria, for example. The use of dashcams is prohibited anywhere by law, with fines of €10.000,00 or even €25.000,00 for repeated offenders. That’s just crazy! And while that is pretty clear for the Austrians, what about the foreigners, whose home country does allow a dashcam and are passing through or going there on a holiday? Definitely a grey zone there that should be clarified. Luckily, there is one loophole in the system and that is the fact that the law is based on surveillance of your property, which does not allow you to record footage, unless it is your own property in a fixed place, such as your house or driveway. Public roads are not allowed to be surveyed by a private owner, which is what you would be doing in case of an accident and providing the footage as evidence. Go Pros and other action cams (like helmet cams for motorcyclists) are actually allowed because they are meant for private use, for recording your trip and showing it to your family afterwards. As long as it is meant for “touristic” purposes, like filming the beautiful mountain scenery you’re driving through, you should be fine. Just make sure that if you put it on the internet (or show it to the public in other ways, you make all Austrians unrecognisable to avoid any trouble. Germany has a similar situation, where dashcams are tolerated, but not really allowed to be used as evidence in case of an accident. So again, as long as you use it for private purpose, to film your road trip, and don’t put it on the internet, you don’t have anything to worry about. This is kind of strange, that in these countries you actually are allowed to film your route, but if something happens, you can’t use it as evidence that you’re not at fault. There have been cases in German court where someone had footage proving he was right and the other guy was lying, but the judge didn’t want to accept it as evidence and didn’t even want to look at it. The judge was of the opinion that carrying a camera around to secretly supervise other people without a specific cause violates the fundamental right of informational self-determination. He put this right above solving cases of civil and criminal law. How stupid is that! Luxembourg is also one of those countries that prohibits dashcams. Technically, it is not prohibited to have a dashcam in your car. You’re just not allowed to capture any footage of people and cars in public places, which includes the public roads. So, owning one is legal, using it could get you fined or imprisoned. Same reasoning applies here and that is that the law exists to protect people’s privacy in public places. And once again, a dashcam is compared to having a CCTV system in your car. Recording people and cars recognizably then counts as enfringement of their data protection rights. So, especially for Luxembourg, where even recreational use of dashcams is not allowed, my advice would be to not worry too much about this and when you get pulled over by the police, quickly pull out the power socket, so it is not recording (remember, you’re allowed to have one, just not use it 😉 ). And don’t try to use it as evidence if you’re involved in an accident. Again, privacy laws make this a grey area, but on the other hand, some insurance companies are actually looking into making their contracts cheaper if you have a dashcam installed. The reason behind this is simply the fact they have more chance of finding the guilty party with footage than they do by people having to write down everything, especially in a hit and run type of situation. In all other European countries, dashcams are allowed and you don’t have to worry about anything. At least, so far. It’s just that in France, for example, the camera must not obscure the view of the road. So, forget about putting your GPS system and smartphone on the windscreen anyway. And depending on the features of the dashcam, you may get into trouble in Switzerland and Liechtenstein, because speed camera alerts are forbidden there (which the ThinkWare F770 has). In France, it is forbidden to have exact locations of speed cameras. That is why TomTom uses a “danger zone” instead in France. Fines could reach upwards of €1.500,00 if they catch you, but I’m not sure how active police are seeking out these devices. But that is only for the speed camera warning system, which you can disable on a ThinkWare anyway (by unchecking the “Safety Camera Alert” setting), so it shouldn’t be a problem. As for recording footage and using it as evidence, you’re covered in all these other countries throughout Europe. What kind of dashcams are there? There are many types of dashcams out there. Some are more conspicuous than others, some are bulkier than others, some are higher quality than others. In this section, I’m only going to cover the 3 most frequent installed dashcams in a Tesla. This dashcam is specifically designed for the Model S and is by far the most beautifully integrated of the 3. It snaps onto the front of the camera housing of the front camera and is easy to connect to a connector that is readily available there. The biggest drawback of this camera is that at the time of writing this post it is only available for cars equipped with AutoPilot v1.0 hardware (the cars with only 1 front-facing camera). If you have an older car without AutoPilot, or you have a “hardware 2” car, you can’t use this one. 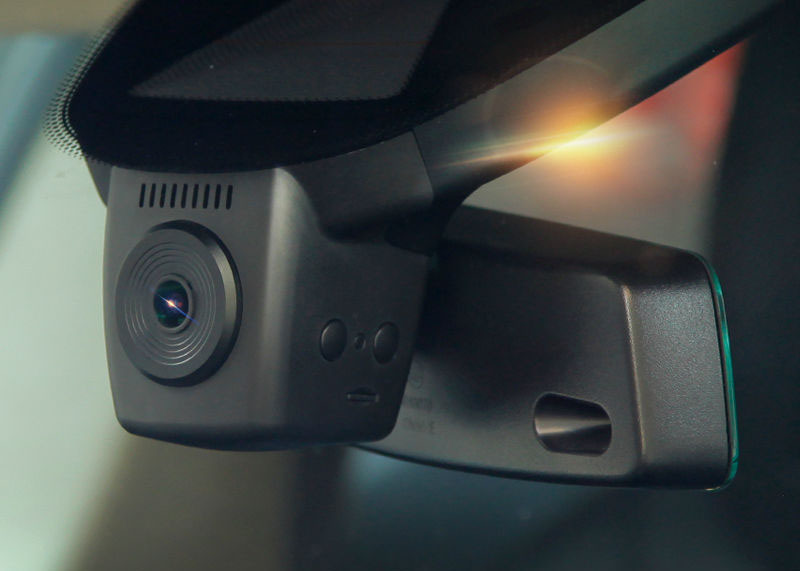 A second drawback is also the fact that this is only a front-facing dashcam, with no option to connect a rear camera as well. A maximum of 64GB can be used for the SD card, getting you only around 12 hours of continuous recording at full HD quality and 30fps, which for me personally is just not enough. It also records in MOV format which has a lower compression rate than the other two that use MP4 compression. That is why they can get more footage on the same size SD card. This is a 2-channel camera system, which means you can monitor and record both front and back of the car. It has full HD cameras both front and back. It also has additional features such as lane departure warning, front collision warning (both of these are standard on a Tesla vehicle equipped with AutoPilot hardware), but it also has a speed camera warning system. This last one may seem interesting, but it is forbidden in several European countries to have such systems, even on your mobile phone. Design wise the ThinkWare may seem somewhat bulkier than the Blackvue, which I’ll discuss in just a minute, and it actually is a tiny bit. 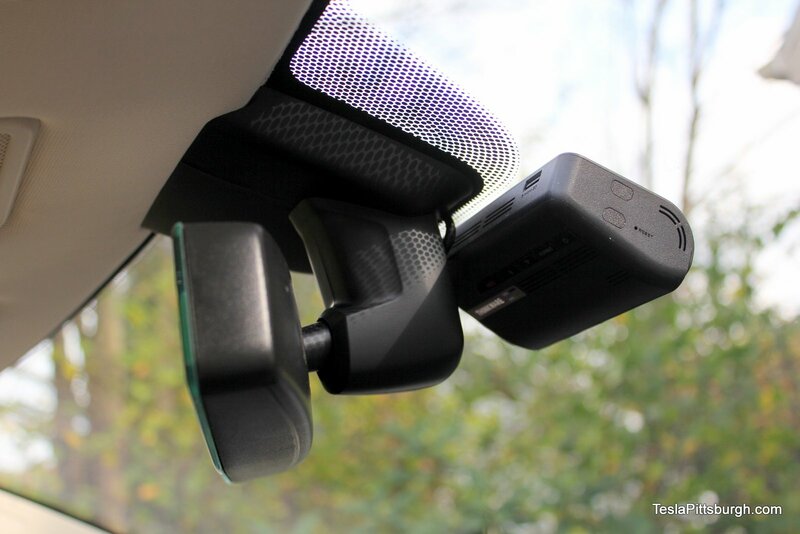 Also, the connectors are a bit larger than on the Blackvue, which has the small coax connectors for hooking up the rear camera to the front one, whereas the Thinkware uses a micro-USB connector. Because the rear camera is also full HD quality, you get better images and the ThinkWare is generally a little bit better in low light level conditions. But the drawback is that you won’t get more than 18 hours on your SD card, before it starts overwriting itself, because the camera is limited to only work with SD cards up to 64 GB. This is another 2-channel system and by far the most installed dashcam in Tesla cars all over the world, even though prices are about the same as for the ThinkWare. But personally, I also find this one a little prettier than the ThinkWare and its design allows for completely invisible installation behind the rear-view mirror. The Blackvue also has a multitude of options to configure and personalise your settings. Other than that, Blackvue is a Korean manufacturer and Korea is well-known for their quality in camera products. The IRO, on the other hand, is Chinese and even though several owners are happy with this camera, the quality still is a little behind on the other 2. The rear camera of the Blackvue is “only” HD quality, but that mean you can get up to 2 full days of recording on the SD card before it starts overwriting itself. Interested in getting a dashcam? If after reading all of this you decide you want a dashcam in your Tesla, the IRO is an easy DIY project if you have the right car. The other 2 dashcams are not so easy to install yourself, at least if you want all the wiring to be as invisible as possible and if you want 24/7 recording. In the example above, the wires you see are the only parts of the wiring that is visible in the whole installation when installing a Blackvue dashcam by a professional. Luckily, I started to expand my business a few months ago and ventured into installing dashcams into Tesla cars, and specifically only in Tesla cars. Just have a look at my website for more information and fill out the contact form if you want to make an appointment.